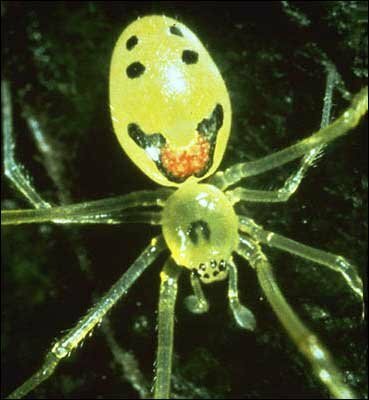 This little guy, more formally known as Theridion grallator, is native to the Hawaiian islands. It grows to a length of about five millimeters. On The Island of Maui, the patterns tend to be hereditary, but on the other islands they appear to change based on the spider's diet. Given their small size, as well as their ability at hiding during the day, they aren't a major prey item on anyone's menu. The purpose of their coloring is still unknown. their heads tucked face-down between their knees. 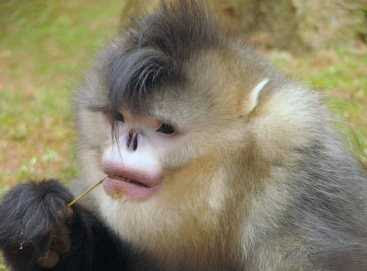 So, basically, what you've got there is an old kind of monkey dressed up as a new kind of monkey. Someone ought to give it some candy bars as a Halloween reward, don't you think? 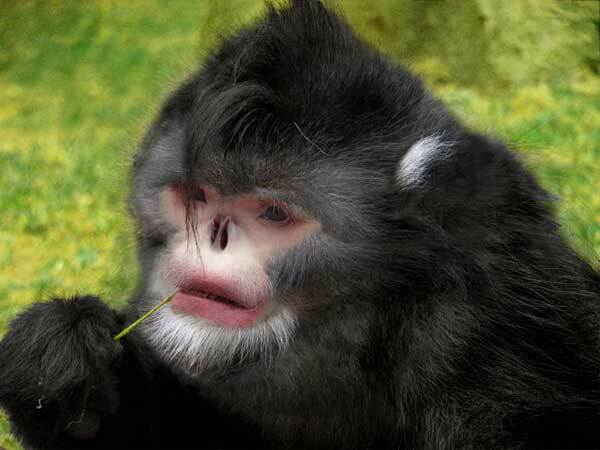 Photos from Live Science and the American Journal of Primatology. It's therapeutic for me to post on men who are much more manly than me. It shows that I'm at least big enough to be able to tout their accomplishments without feeling that they're overshadowing my own (which, of course, they are). One such man is Jeremy Wade, a British biologist, TV host, and angler. He is one of the few men ever to haul in a goliath tigerfish (Hydrocynus goliath). To do so, he had to navigate uncharted stretches of the Congo river, wait patiently for eight days, and then snag the beast with a large catfish as bait and a 200lbs rod and line. And what did he catch? The goliath tigerfish is one of the world's most dangerous fish. This specimen was five feet long. They come equipped stock with 32 teeth, each one razor sharp and about the size of great white shark teeth. They are amazingly aggressive (their reflex is to attack any sudden motion). They can remove human limbs with a single bite, are known to eat creatures the same size as them, and commonly take bites out of crocodiles. And Jeremy Wade held a live one in his arms before releasing back in the wild. I'm going to head upstairs now and sleep in my cozy bed in my cozy suburban neighborhood where the most dangerous thing I'll hold today is my two-year-old son who has a head cold. Thanks for the link, Alan. 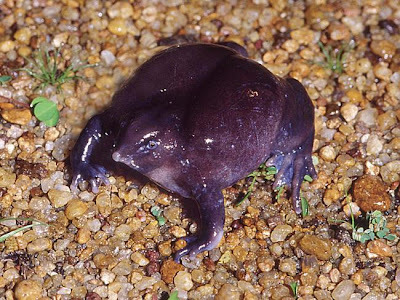 We've seen the purple frog of India a couple of times before (here and here). But I have to say, I looked at those pictures and thought, something has to be wrong. Frogs are usually cute, or even pretty. Even toads have a kind of lumpy aesthetic appeal. Surely the photographers caught those frogs at an awkward angle, or a bad moment. But if there was ever a glamour shot of this species, this has to be it, and there is no denying its majestic hideousness. It is appalling in all its proportions. It even looks like it would feel nasty, and I'm speaking as someone who has picked up frogs hundreds of times in the course of a career. This frog was only discovered by scientists in 2003. It was overlooked because your only chance to see it is two weeks of the year in the monsoon season. The rest of the time, it hides underground. Poor thing, now I understand why. 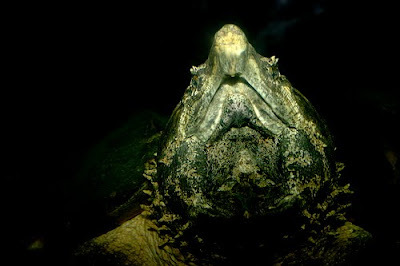 Came across this beauty while searching for a gruesome photo for my other blog and finding that searching for alligator and turtle naturally gets you a lot of photos of alligator snapping turtles. We've seen this species before, of course, but not this particular interesting angle. Perhaps that's because this is normally not the smartest place to be with respect to a snapping turtle, but fortunately, this guy is safely behind glass at the National Zoo. Photo by Brian Gratwicke on Flickr. Here's another species of tube-nosed bat to apologize for the technical difficulties with the last one. I think commenting on that post is working now. 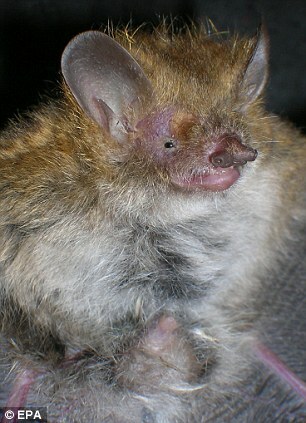 Eleryi's tube-nosed bat from the Daily Mail. 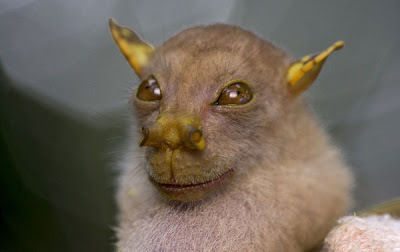 This tube-nosed fruit bat was observed on an expedition to Papua New Guinea that discovered a number of new species. This guy has been seen before but hasn't been officially scientifically described, which means it doesn't have a name yet. Its genus is Nyctimene, so I say we call it Nyctimene ugdorable. Thanks to Discover magazine's blog 80 Beats, where you can see the expedition's other newer but mostly less ugly species (although don't miss that spiny leg katydid). Normally, I wouldn't put a capybara on this blog, as I think they are the most beautiful of animals. 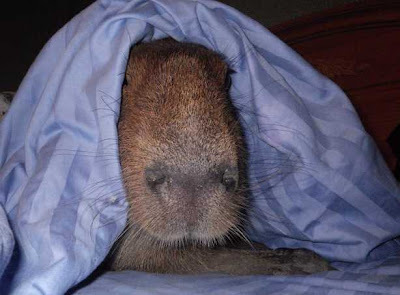 But on a Monday, it's sort of reassuring for all of us mere mortals that even Caplin Rous, the World's Most Famous Capybara, doesn't look his best first thing in the morning. Follow Caplin on Twitter, be his fan on Facebook, and read his blog at the link above. Starting off October with three creatures so scary, you should make plans to dress up as them for Halloween. Look at those gaping maws like the mouth of hell, plumage like strips of rotting flesh, and cold, dead eyes! These must be zombie birds, right? 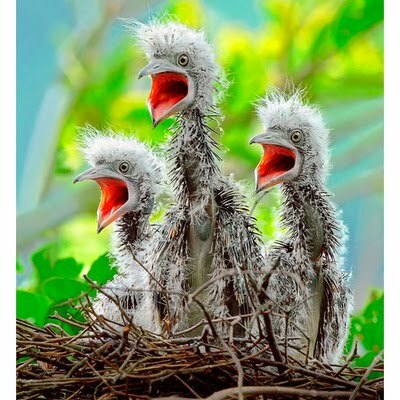 Yet the Telegraph's Pictures of the Day claims they are perfectly innocent baby Malay night herons. I'm not sure what to believe.